Dr Blood's Video Vault: Hudson Horror Show 8 is coming soon! Hudson Horror Show 8 is coming soon! Hudson Horror Show is proud to announce our full lineup for the Hudson Valley’s horror and exploitation film festival, Hudson Horror Show. HHS #8 will be on Saturday, November 16th 2013, at Silver Cinemas South Hills 8 in Poughkeepsie, NY. Doors open at noon, show starts at 1PM. Headliner #1 is the 1981 sci-fi/action classic ESCAPE FROM NEW YORK. John Carpenter directed one of the most amazing genre casts ever featuring Ernest Borgnine, Donald Pleasance, Isaac Hayes, Harry Dean Stanton, Adrienne Barbeau, Tom Atkins, Lee Van Cleef and of course Kurt Russell as Snake Plissken, who we all heard was dead. Headliner #2 is the 1982 horror/sci-fi thrill ride JOHN CARPENTER’S THE THING. Carpenter and Russell teamed up again for one of the scariest films ever made, which boasts the amazing creature and special effects from Rob Bottin. 30 years after both Carpenter classics were originally released, we are thrilled to present these movies the way they were meant to be seen, off real 35mm film! If the alien from The Thing doesn't scare the pants off you, well, you just might want to take your pants off anyway for INVASION OF THE BEE GIRLS. Starring cult film icon William Smith (Red Dawn, Grave of the Vampire) and the beautiful Anitra Ford (Big Bird Cage) this sci-fi/horror/exploitation hybrid has the sexiest murdering space aliens ever seen. With a fun script written by Nicholas Meyer (who later wrote and directed Star Trek II and Star Trek VI), INVASION OF THE BEE GIRLS is one of the best “B” movies ever made. Our last show was a complete sell out and tickets for this show are already selling faster than ever before. Don’t miss it, get your tickets now! Advance tickets are just $26.00. Click here to order: http://www.hudsonhorror.com/purchase-tickets/. If any tickets remain the day of show, they will be available for $30.00, cash only. As always we’ll have vendors selling toys, DVD’s, t-shirts and all other merchandise. If you are interested in being a vendor, or if you have a question about the show, shoot us an email at info@hudsonhorror.com. 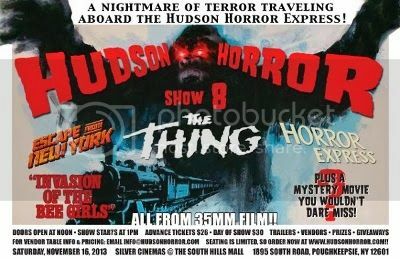 Keep watching our website and Facebook page for more info, and we’ll see you on Saturday, November 16th 2013 for Hudson Horror Show 8!